Hello! Welcome to the Gundernet! My name is Andrew Gunderman. I am a senior at Hillsboro High School in Ohio and I am going to study computer science in college next year. I began coding around age 17 and my interest has since grown into an obsession. I began programming in Java and I soon switched to C#, which has become my language of focus. However, I still have broad knowledge in an array of different languages, frameworks and tools as to give myself well rounded programming experience in a variety of topics. C# was the second language that I began learning, the first being Java. It is likely my most in depth language and I have used it for a majority of my projects. I am very experienced with WPF having used it for a multitude of applications and having worked with it for most of my programming career. WPF was also the first GUI that I really began to use. I have some limited experience with Python. I know basic syntax and have built some simple programs such as a Tab Explosion and some other text based programs. I have some limited experience with Unity. I know how it works and I can build some basic games with it. I have built a few basic games so far, but I am looking to go deeper into learning about it. I own a Raspberry Pi and I have used Idle to do some Python programming on it along with connecting it to a monitor, but other than that I have yet to do much else with it. I have plans for other projects that I want to do with it. 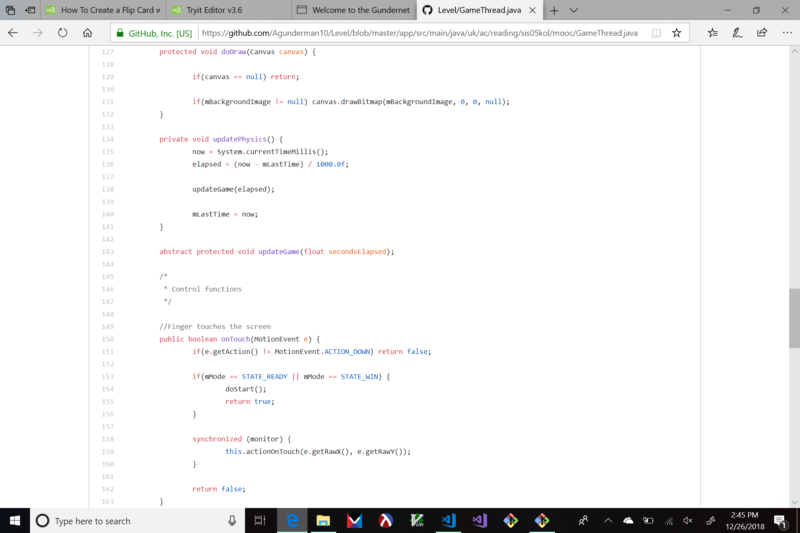 I have a little experience with C. I have built mostly text based programs with it so far, but I have an understanding of the basic syntax and pointers. I have experience with Data Structures and Algorithms. I have read through a Data Structures and Algorithms book and taken a Princeton Algorithms course. I have experience with Stacks, Queues, Graphs, Trees, and Sets along with the more basic Data Structures such as Arrays, Lists, etc. I have experience with some Algorithms such as Bubble sort, Merge sort, Insertion sort, Binary Search, Quick find, Quick union, along with Algorithm improvement techniques such as weighting and path compression. I have a basic understanding of powershell and I am able to build small programs to do desired tasks. It is something I am planning on looking into more and learning more about it. I have a lot of front end experience in web development. I built my high school's Robotics website from scratch. I have experience making animations for the websites I make including loaders, flip cards, fade-ins, and other animations. I have an artistic eye and I am able to build websites that are pleasing to the eye. I have some experience with PerfView. PerfView is a Microsoft program that measures how long it takes for a certain task to be completed. This is very useful for performance based applications and it is often used in the real world for Windows applications. I have experience using it and attempting to improve the times it outputs to improve performance of my applications. I have a decent amount of experience with Git, having worked with it ever since I began programming. I have experience with commit, push, fork, clone, merge and pull requests and other commands. I have experiene with Git UI, but I mostly use Git on the command line or in Git Bash. I am relatively experienced with Java. I have worked through part of an online Princeton Algorithms class in Java. Java was my first programming language that I began learning with. 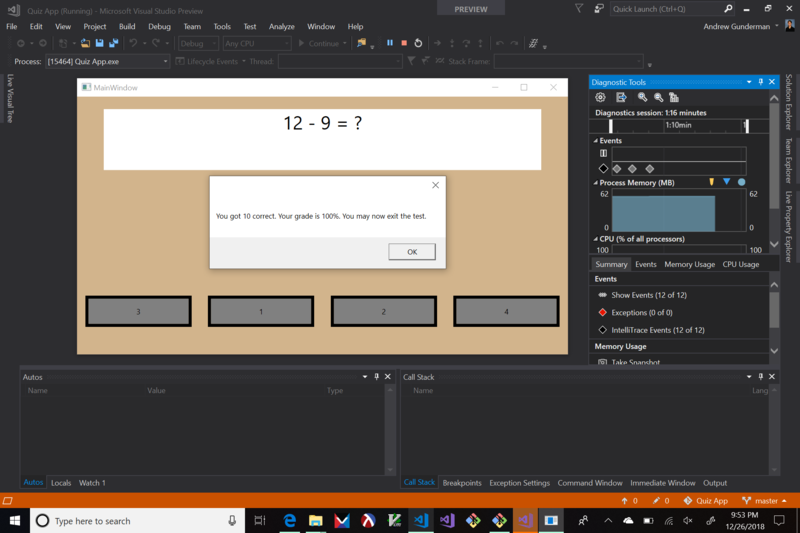 I have built Pong, and Level, which is a mobile app that would determine if a surface is level or not by the orientation of the users device. I have some experience working with Android mobile developement. I worked through some MOOCs online and soon after I created an Android app that tells the user if their phone is on an even surface or not depending on the orientation of their device. I have some basic experience with C++. I have built some simple text based applications with C++ and I am working on learning more. I also programmed robots with C++. See the VEX C++ tab. I have experience with the Arduino. I enjoy working with hardware as well as software. I have built multiple programs with the Arduino including a light show, a music making application, and others. I have a whole kit of parts and I plan on doing more with the Arduino. VEX C++ is basically just C++ with some external libraries to make motors and the robot Brain work correctly. I was the programmer for my robotics team in high school and I programmed our robot to complete various tasks with VEX C++. These tasks included having the robot climb onto a platform, shooting a ball at flags, flipping caps to our team color, and hanging caps on posts. I was able to write the code for our robot to complete these tasks autonomously and while being controlled by a driver. I have a decent amount of experience with HTML. 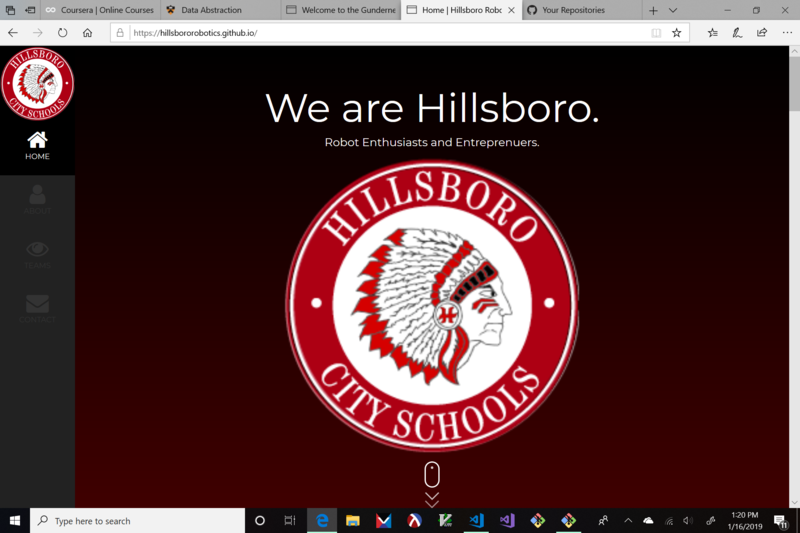 I used HTML to build this website and the Robotics website for my high school. I have experience with CSS and I have used it on a multitude of different websites. I enjoy using CSS to create animations and to help style the websites that I create. I have experience with SQL and have taken some online courses to work through how it works and to understand the basic syntax. I have a little experience with Xamarin, but have yet to build anything amazing with it yet. I am looking to learn more about it as time goes on. I have a decent amount of experience with Racket. 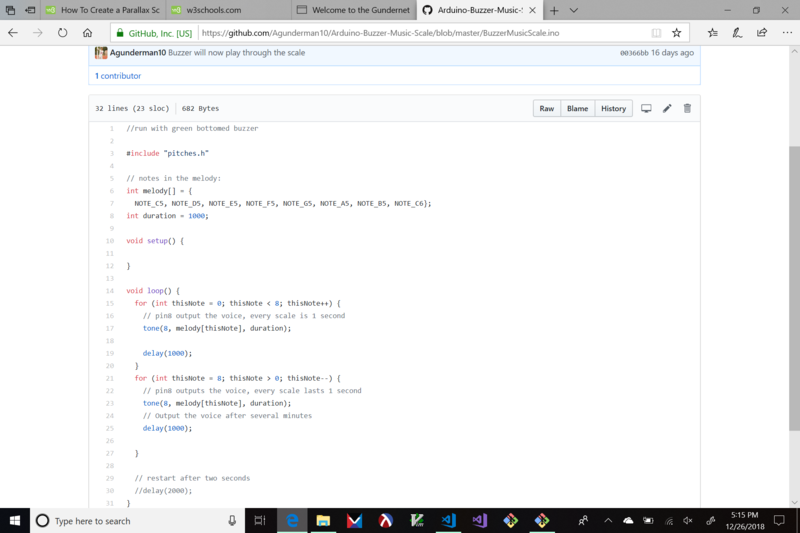 Racket is one of the first languages I used, it is a functional programming language and so it is very different than other languages that I have used. I have built tons of arbitrary text based programs with Racket and it is where I really learned recursion. I also have learned multiple searching algorithms in Racket such as Bubble sort, Merge sort, and Insertion sort. 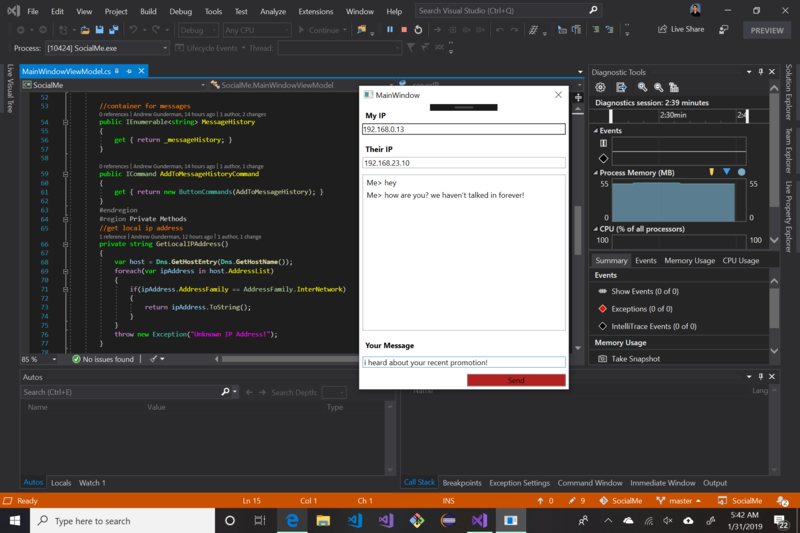 Chat app built with C# and WPF to learn more about TCP networking. 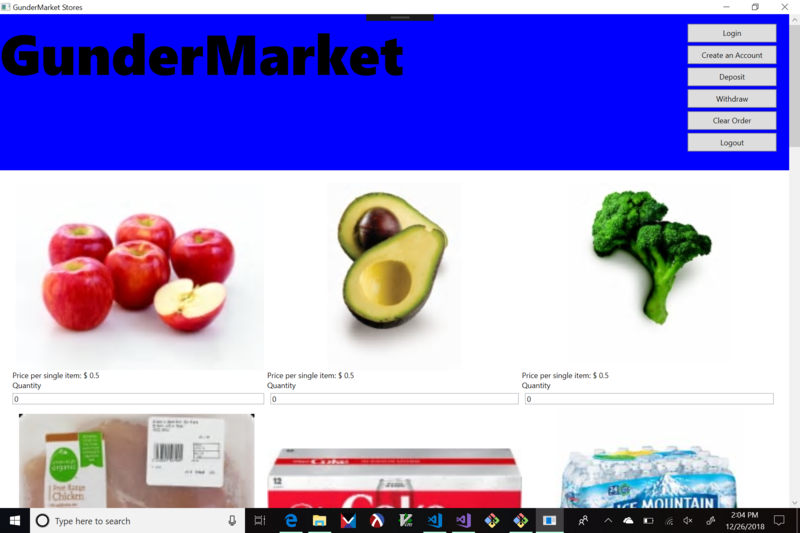 Functioning store application created to demonstrate how easy it would be to create a typical store application that one might find at a place like Kroger or McDonalds. 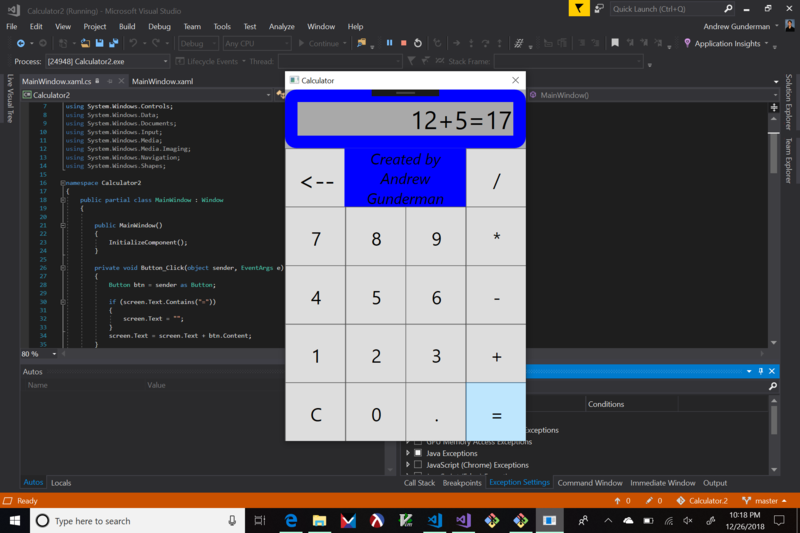 Calculator built with C# and WPF as one of my first projects in C#. A program for the Arduino that plays through the music scale on a passive buzzer. With some manipulation of the tones this program would be able to play whatever type of music that you want it to. Website built for my high school's robotics team. This website is linked to the school's official website and was entered into a world wide Robotics website competition. Quiz application built to help elementary math students improve their math skills. Android application that tells the user if a surface is level or not based on the orientation of their device. 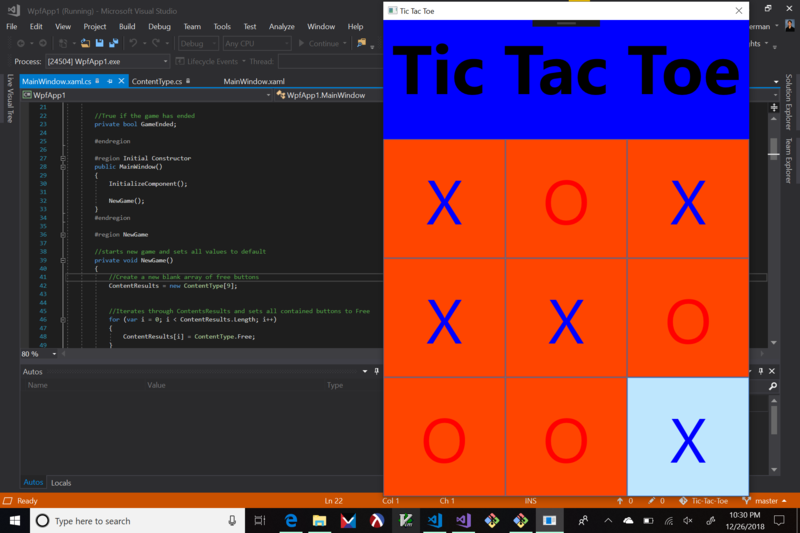 A Tic Tac Toe game built with C# and WPF for fun. This was one of my first C# applications. A program for the Arduino that plays through the music scale on a passive buzzer.